The Daily Telegraph headline screamed, “From Manus to Manhattan” as if, after four years of hell on Manus, refugees were about to live in luxury apartments next to Central Park. Shock jock 2GB host Ray Hadley sneered that refugees were wearing designer sunglasses, and Immigration Peter Dutton joined the chorus with comments about refugees on Nauru having the, “world’s biggest collection of Armani jeans and handbags”. More smears from Hadley and bile from Dutton. The sunglasses cost less than 10 kina (A$5) at the Lorengau market on Manus, and refugees were mostly being scattered across western states of the US. The refugees are even required to pay back the cost of the airfare–$US2500. But facts don’t matter to Hadley or Dutton. The beginning of refugee resettlement in the US has also revealed all the flaws. It is painfully slow. It has taken 11 months to get 52 people off Manus and Nauru. Even if 50 people were moved every month, it would take almost three more years to get the refugees off the islands. The crisis on Manus and Nauru remains unresolved. Hundreds of people will be left behind on Manus and Nauru that the US deal does not account for. And the conditions on the islands continue to deteriorate as people lose their minds and lose their lives. The death of a 32-year-old Tamil refugee on Manus brought the number of deaths there to six—two suicides there in less than two months. The responsibility lies with the Australian government and the offshore detention policy that imprisoned them for four years. The US deal won’t get the Australian government off the hook. 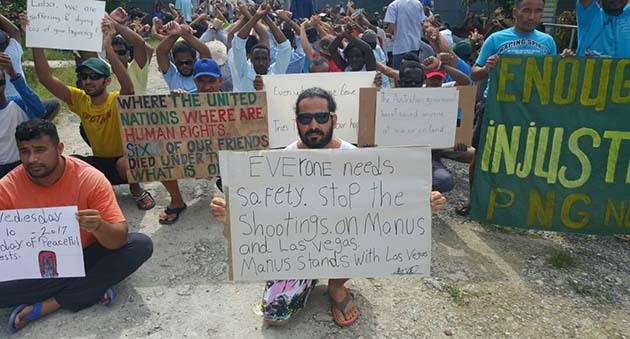 There are around 800 refugees or asylum seekers either on Manus or in Port Moresby. PNG has no resettlement plan. On Nauru, conditions are set to decline dramatically as services are withdrawn from refugees after the Broadspectrum contract ends in October. On both islands, the years of detention, the uncertainty, and family separation, has created an epidemic of mental illness, for which freedom is the only cure. The need to evacuate Manus and Nauru only grows more urgent. After barring people seeking asylum from applying for protection for years, in May, the government gave 7000 people a deadline of 1 October to apply for a protection visa or risk being prevented from ever being allowed to do so. A massive community effort was scaled up to contact asylum seekers who had been left in limbo for years and to help them to apply. It was an enormous challenge for the few community centres that offered free assistance. As the 1 October deadline approached, there were about 500 asylum seekers who had still not applied. Legal action will be mounted if the government should attempt to deport any asylum seeker without allowing them to apply for protection. Like the outpouring of support for the refugees from Manus and Nauru that the government cut off from housing and income support, the community response to meet the deadline has been fantastic. The Refugee and Casework Services in Sydney reports that since the deadline was announced in May, they have assisted 1779 families and individuals. Now the government says that it expects all interviews to be completed by October 2018. The ruthless funding cuts to the community legal centres are just one more reason that the Turnbull government has got to go. Labor has promised that temporary protection visas will be replaced with permanent visas once they take office. More than that, Labor needs to commit to re-instate the funding of the legal centres and to fully support all asylum seekers and refugees that the Liberals have cut off support.